The dilemma remains–rug v no rug in the dining room. I am trying to decide what to do at my house. Currently, I do not have a rug under the dining table. I always thought it was weird to have food over any soft surface other than hardwood, stone or tile, but lately all these fabulous dining rooms with rugs under the table changing my mind. Dining tables rugs ground the space are, and they’re winning me over. Let’s decide on rug or no rug. Here are a bunch of great dining rooms: some with a rug under the table, some without. Which do you think looks better of these fabulous dining rooms. I found a few great ones with rugs under the table and a few without. 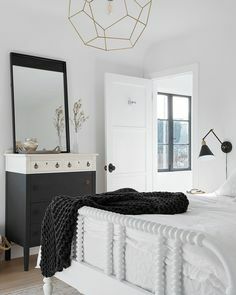 I love the simplicity of this room. A rug here would take away from the minimalistic feeling and distract from the oversized frame. I can just imagine having a meal on this walnut table. Less really is more. On the other hand, I love how cozy the rug makes this room. A similar walnut table looks very different with a faded rug. I especially love the long buffet and mirror above to tie in this great dining room. This dining room is serious inspiration. Who knew a striped rug could work in a dining room? I love the way the black and white tie in with the leather chairs. This is such a great, simplistic meets country look. I need this much natural light in my dining room. Love the black chairs and reclaimed wooden table. With the oversized light fixture, banana leaf plant, buffet and artwork, a rug in this dining room would take away rather than add. This wall puts white walls to shame. And this rug just feels so cozy. I can just imagine Thanksgiving dinner here. Especially with these chairs. But every time I think I’ve decided on a dining room with a rug, I see how simple and perfect without rugs they can look. I love how long this dining room table is. There might just be five chairs, but this table can fit many more. The view isn’t the only great thing about this room. I seriously want these chairs in my life. This dining room wouldn’t be complete without that rug. What do you think? Rug or no rug? In each photo without a rug, I feel like the room looks incomplete. I used to be very into the stark look of bare floors, but now, I feel like every nearly every dining room needs one. I think it’s something about all of the table and chair legs looking like they are going to slide around or something. But in some of those photos, I want to remove the end chairs, because they look like they are falling off the “island.” A dining room rug needs to be large enough to accommodate all of the chair when they are pulled away from the table…and that means a pretty big rug in may cases. Personally, I have found Flor tiles to be the perfect solution to the DR rug question. They are often patterned, very easy to vacuum crumbs, and can even be washed in a sink if a real spill happens. And their modular design makes customizing the size really easy. Although it’s a pain to clean a rug that is under the dining room table, I agree rooms looks unfinished and somewhat cold to me in the absence of a rug.